This is a great looking building. A head-turner. It was meant to be. It was built by Circassians, the original settlers of Amman Jordan. The Circassians arrived in 1878 as refugees from the Russian conquest of their homeland. The site where they settled, now the city of Amman, was empty, a landscape of goats grazing among the abandoned ruins of vanished empires. This mosque was built in 1961 as an identity statement by the small but wealthy and powerful Circassian community. 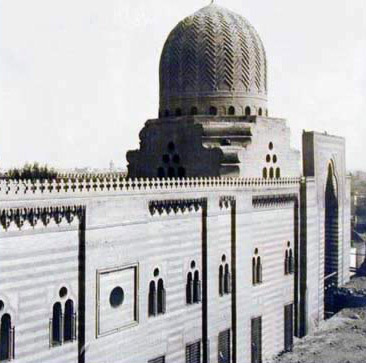 The black and white patterning of the stonework evoke several of the great mosques built in Cairo by the Circassian Mamluk rulers of Egypt, like the one below, built by Sultan al-Muayyad Shaykh in the early fifteenth century. The allusion was apt, since the Circassians of Jordan have been a key part of the officer corps of the the Jordanian army and the administration of the Hashemite dynasty that rules Jordan, and largely excludes the Palestinian majority from the government. Here is a photograph of Amman taken in 1918 by Col. D.G. Croll who donated his wartime photographs to the Australian War Memorial.